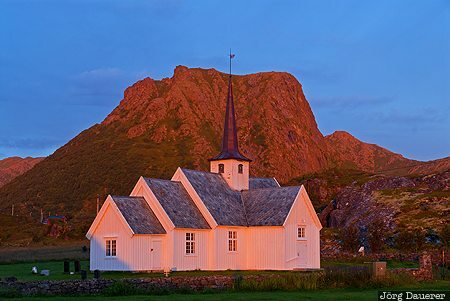 The lonely wooden stave church of Langenes illuminated by the first light of the day. Langenes is at the northern tip of the island Langøya which is part of the Vesterålen in the province Nordland in northern Norway. This photo was taken in the morning of a rainy day in August of 2010. This photo is part of the exhibition Lonely Chapels (October 2010). This photo is in the Photo Calendar "Norwegen". This photo was taken with a digital camera.